Southern senior Dylan Smith (0) goes up for a shot in between Rebels Curtis Haner (5) and Bryce Nolan (23), during the Tornadoes’ 88-41 victory on Friday in Racine, Ohio. South Gallia junior Eli Ellis (10) goes in for layup in front of Southern junior Weston Thorla (4), during the first half of the Tornadoes 47-point victory on Friday in Racine, Ohio. RACINE, Ohio — It was simply a good night to be a Tornado. 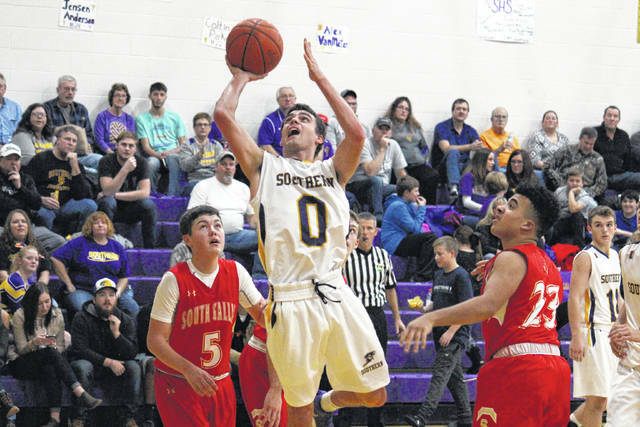 The Southern boys basketball team had all-five starters score in double digits and the Purple and Gold controlled ever aspect of the game, as the Tornadoes stormed to a 88-41 victory over Tri-Valley Conference Hocking Division guest South Gallia on Friday in Meigs County. 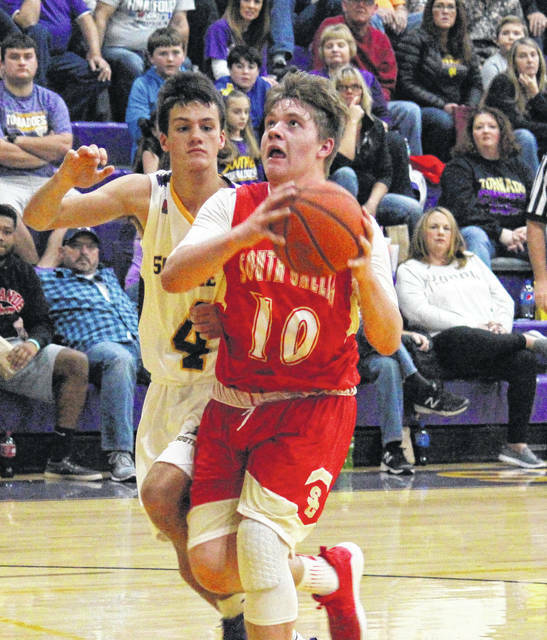 Southern (2-0, 1-0 TVC Hocking) — which held a presentation celebrating its 100th year of basketball prior to the game — never trailed in the contest, sinking 10 field goals in the opening period en route to a 24-8 lead. 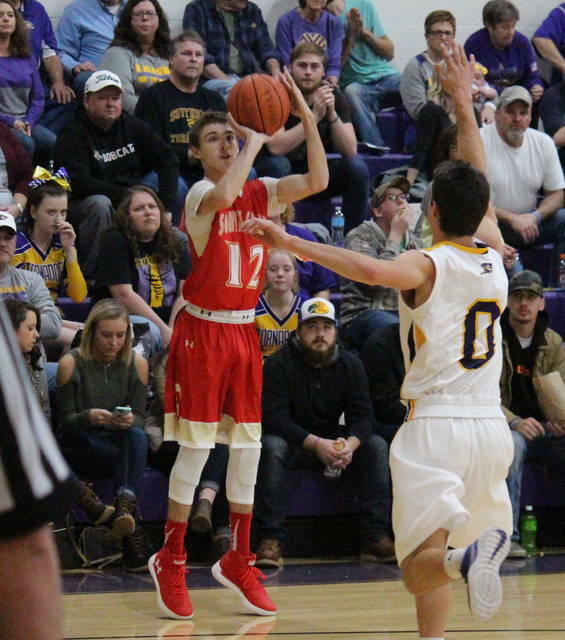 The Tornadoes outscored South Gallia (0-2, 0-1) by a 32-13 clip in the second quarter, making the margin 56-21 at the midway point. Southern continued to extended its lead after the break, outscoring the Rebels by a 17-to-11 clip in the third period to make the margin 73-32 with eight minutes to play. The Purple and Gold capped off the 88-41 victory with a 15-to-8 fourth quarter run, with the final margin of 47 points being the largest lead of the night. As a team, the Purple and Gold earned a 41-to-27 rebounding advantage, including 15-to-11 on the offensive glass. Southern claimed a 19-to-9 edge in assists, and a 16-to-4 advantage in steals, while recording the game’s lone two rejections. SHS turned the ball over 15 times, while the Red and Gold gave possession away 27 times. The Tornadoes shot 36-of-72 (50 percent) from the field, including 4-of-14 (28.6 percent) from beyond the arc. From the free throw line, Southern was 12-of-22 (54.5 percent). The Rebels made 15-of-48 (31.3 percent) field goal tries, including 3-of-9 (33.3 percent) three-point attempts. SGHS was 8-of-19 (42.1 percent) from the charity stripe. The Tornado offense led by Dylan Smith and Brayden Cunningham with 14 points apiece, to go with eight and seven rebounds respectively. Smith also earned a game-best six assists for the Purple and Gold. Weston Thorla scored 13 points in the win, Trey McNickle added 12 points, while Jensen Anderson poured in 10. Off the bench for Southern, Coltin Parker accounted for eight points, Austin Baker added six, Austin Vancooney scored five, Alex VanMeter chipped in with four, and Jason Counts posted a pair. The Tornado defense was led by Cunningham and McNickle with three steals and one block each. The Rebels were led by Eli Ellis with 21 points and six rebounds, followed by Austin Stapleton with seven points and five boards. 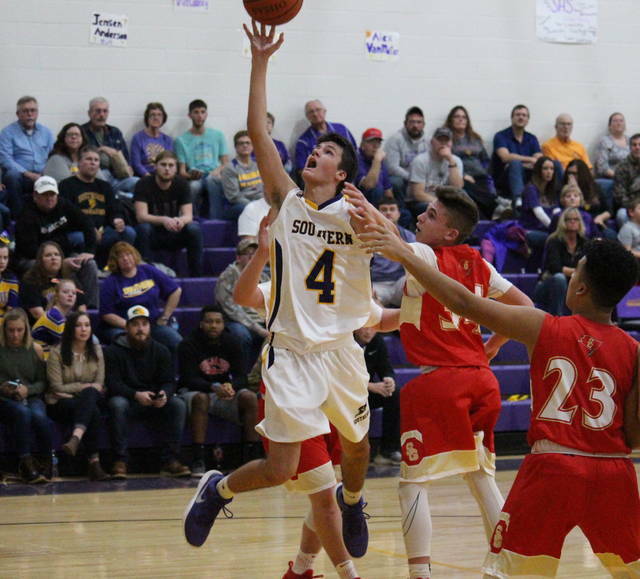 Curtis Haner posted six points and team-highs of four assists and two steals, Austin Day added four points, while Bryceton Folden contributed three points to the SGHS cause. After visiting River Valley on Saturday, Southern resumes TVC Hocking play on Tuesday at Trimble. The Rebels are back in action on Tuesday for their home opener against Federal Hocking. The rematch between SHS and SGHS is set to take place on Jan. 19 in Mercerville.